In his final tune-up before his start on opening day in Milwaukee, Mikolas allowed four runs on six hits, including two home runs, and two walks. But the Cardinals' hurler did do some damage at the plate himself. 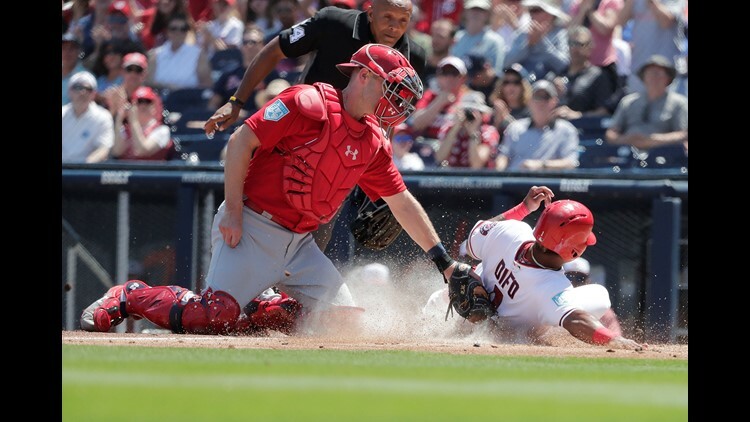 The three-way battle to land the final spot on the Cardinals’ bench to start the regular season was on full display Saturday against the Nationals. All three players – Drew Robinson, Yairo Munoz and Tommy Edman – were in the starting lineup. Robinson started at shortstop before moving to center field; Munoz started in center before switching positions with Robinson and Edman played the complete game at second base. Nothing really happened to change the status of the three players. Robinson was 0-of-5, although a scoring decision to charge an error cost him would likely should have been a leadoff triple against Stephen Strasburg. He also struck out three times. Munoz had a single in four at-bats, while Edman was 0-of-3 with a walk, striking out twice. It is likely the decision about who makes the roster will not be made until after the Cardinals play in Memphis on Monday night, and perhaps even later. If Jedd Gyorko has to begin the season on the injured list, which is a possibility, then two of the three could make the team to start the season. High: Miles Mikolas was better with the bat than he was on the mound, hitting a two-run homer. Research found it was the first home run hit in spring training by a Cardinals pitcher since Jason Marquis hit one in 2006. Low: In his final tune-up before his start on opening day in Milwaukee, Mikolas allowed four runs on six hits, including two home runs, and two walks over three innings. He finished the spring with a 6.23 ERA. At the plate: Tyler O’Neill had the best day for the Cardinals offense, going 4-of-5 with a double and three singles, driving in one run … The only other player with multiple hits was Max Schrock, brought over from the minor-league camp, who had two hits and an RBI … Dexter Fowler was 0-of-4 and struck out three times. As a team the Cardinals struck out 14 times, nine of them coming in 5 2/3 innings against Srasburg. On the mound: Dakota Hudson followed Mikolas to the mound and worked six scoreless innings, allowing just three hits, as he finished an outstanding spring. He posted a 1.25 ERA for the spring as he won the open spot in the starting rotation to begin the season. Hudson walked two and struck out three and finished the spring allowing just one run over his last 18 innings. Off the field: The Cardinals officially announced the five-year contract extension for first baseman Paul Goldschmidt, locking him up through the 2024 season … The team has not made another move official, but the Post-Dispatch reported Saturday that Jim Edmonds will join the team’s front office as a special assistant to John Mozeliak, the president of baseball operations. It is a title shared by many other former Cardinals. Edmonds will still continue to work as a game analyst for Fox Sports Midwest broadcasts. Up next: The Cardinals play the Marlins on Sunday in their final game before leaving Florida. Jack Flaherty will get the start in his final tune-up before pitching the second game of the season in Milwaukee and then the home opener on April 4 against the Padres.